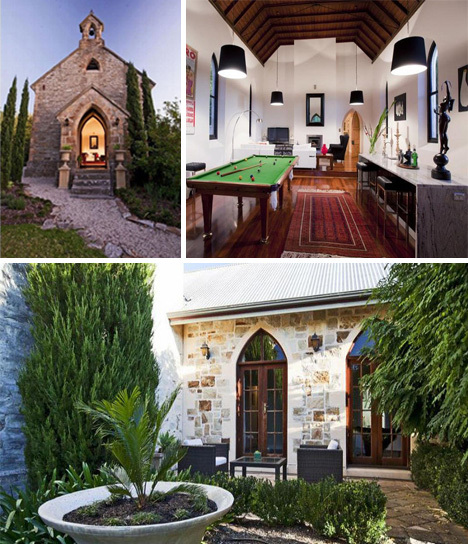 This Australian residence in Houghton is a converted Church that has maintained the outward steepled appearance (including a single, traditional bell), while transforming the inside and outdoor patio into the epitome of modern comfort. The church’s shape was clearly something to be worked around in designing the layout, but it was accomplished admirably. Desire to Inspire has additional photos that give a great tour of the inside. 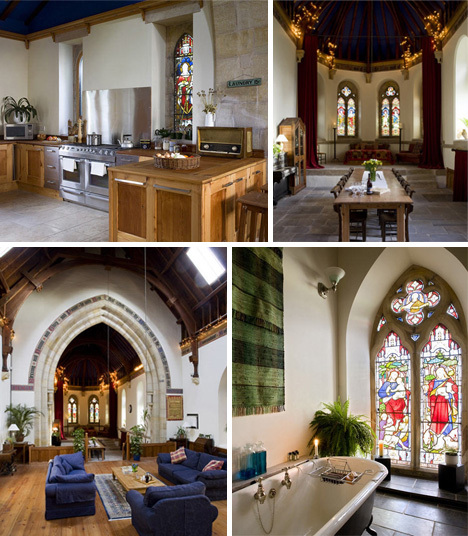 This home in Kyloe, Northumberland is a gloriously renovated church, turned into an open and airy home. The huge archways and incredible stained glass turn a typical living room into a unique experience. One can only imagine how odd it must feel taking a bath with light shining through 8 foot tall, incredibly detailed, stained glass windows, or eating a meal where people used to pray. The owners of this home paid over three times the church’s original value for renovations, and the effort shows, as none of the beautiful details appear to have been lost, while a very comfortable home has evolved. Visit Swipelife for some additional photos. 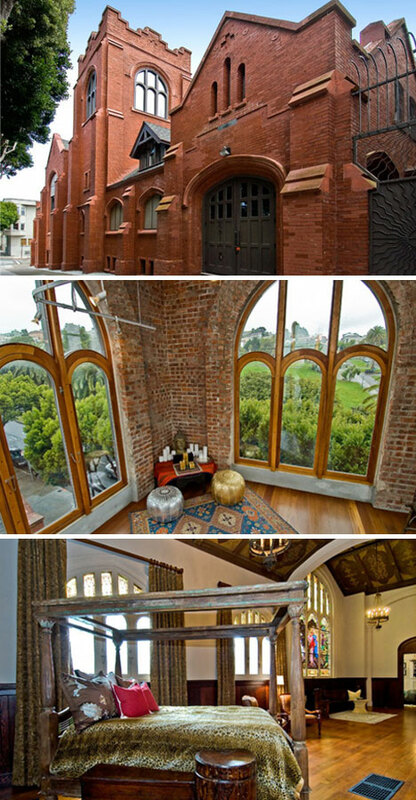 This San Francisco church, built in 1909, was renovated in 2007 and sold for $7,490,000. The high price is well worth it, partly for the location (overlooking Mission Dolores Park), but also because of the incredible transformation that took place inside. Renovations made the old building as solid as a rock, and refurbished every tiny detail. The ceilings were decorated with a careful focus, while the original stained glass windows and arched glass windows provide a ton of light. 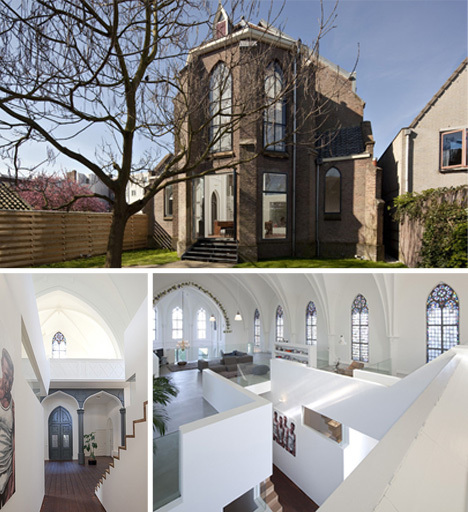 Like most converted churches, the home is notable for the wide-open design and unique layout. Worth the money? It would be hard to argue against it, but let these pictures from Home DSGN make the case. Another church to residence conversion by Zecc, they maintain the old style exterior, as is common in most church renovations, and they manage to add a really unique and livable flow to the inside structure. Building the inside into two stories doubled the living space, while maintaining the original window designs.